Researchers in Portsmouth and Rome have found hints that dark matter, the cosmic scaffolding on which our Universe is built, is being slowly erased, swallowed up by dark energy. The findings appear in the journal Physical Review Letters, published by the American Physical Society. In the journal cosmologists at the Universities of Portsmouth and Rome, argue that the latest astronomical data favours a dark energy that grows as it interacts with dark matter, and this appears to be slowing the growth of structure in the cosmos. Professor David Wands, Director of Portsmouth's Institute of Cosmology and Gravitation, is one of the research team. He said: "This study is about the fundamental properties of space-time. On a cosmic scale, this is about our Universe and its fate. "If the dark energy is growing and dark matter is evaporating we will end up with a big, empty, boring Universe with almost nothing in it. "Dark matter provides a framework for structures to grow in the Universe. The galaxies we see are built on that scaffolding and what we are seeing here, in these findings, suggests that dark matter is evaporating, slowing that growth of structure." Cosmology underwent a paradigm shift in 1998 when researchers announced that the rate at which the Universe was expanding was accelerating. The idea of a constant dark energy throughout space-time (the "cosmological constant") became the standard model of cosmology, but now the Portsmouth and Rome researchers believe they have found a better description, including energy transfer between dark energy and dark matter. Research students Valentina Salvatelli and Najla Said from the University of Rome worked in Portsmouth with Dr Marco Bruni and Professor Wands, and with Professor Alessandro Melchiorri in Rome. 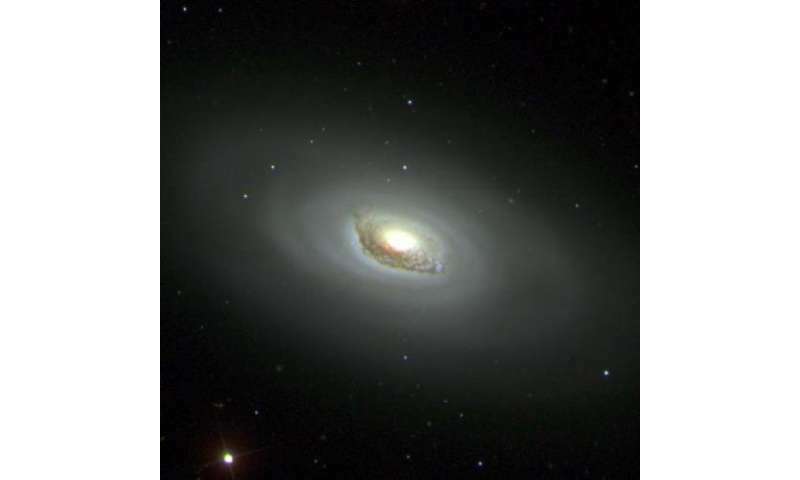 They examined data from a number of astronomical surveys, including the Sloan Digital Sky Survey, and used the growth of structure revealed by these surveys to test different models of dark energy. Professor Wands said: "Valentina and Najla spent several months here over the summer looking at the consequences of the latest observations. Much more data is available now than was available in 1998 and it appears that the standard model is no longer sufficient to describe all of the data. We think we've found a better model of dark energy. "Since the late 1990s astronomers have been convinced that something is causing the expansion of our Universe to accelerate. The simplest explanation was that empty space – the vacuum – had an energy density that was a cosmological constant. However there is growing evidence that this simple model cannot explain the full range of astronomical data researchers now have access to; in particular the growth of cosmic structure, galaxies and clusters of galaxies, seems to be slower than expected." Professor Dragan Huterer, of the University of Michigan, has read the research and said scientists need to take notice of the findings. He said: "The paper does look very interesting. Any time there is a new development in the dark energy sector we need to take notice since so little is understood about it. I would not say, however, that I am surprised at the results, that they come out different than in the simplest model with no interactions. We've known for some months now that there is some problem in all data fitting perfectly to the standard simplest model." We now have invisible matter transforming itself into invisible energy. Not entirely. There are multiple mechanisms whereby this could be true within classical physics. 1, Disappearance of matter (in a curved space-time framework) would have the effect of flattening space-time, which in some situations generates the same observational result as a slight expansion of space-time. 2, Converting matter to energy would not only flatten local space-time, but conceivably transports this energy somewhere else (the bounds of the light horizon) where some of it may be absorbed by other matter, which in turn could produce an attractive force in that direction, which we would experience as an expansion, or more precisely, an opposite curvature, which is to say a universe which appears to be open when viewed from our position. 3, Converting matter to energy may expand space-time itself by a spring function acting against tensile forces in the fabric of space-time itself. All of these assume space is a "thing" rather than a "nothing". Assuming that the red shift in the spectrum of light coming from distant galaxies is not due to the Doppler effect, which is valid for static Euclidean, but not hypothetical expanding (to where?) Space, very strange situations will drop out and thing will come in place. But why to be simple when can be complicated? Rapid decision not to pay wages for a long time. When science is driven by financial motives, it becomes antiscience. Release enough energy, and a spring can be deformed. Release still more and it can be straightened out completely. Keep going and you get necking and then total failure of the material. There is a theory called the "big rip" which claims that space-time itself may experience a total failure if Dark Energy becomes to great. If space-time has tensile properties and mechanical properties, then space-time itself (not just matter and energy contained by it) must obey the laws of thermodynamics. Therefore when space-time is stretched or contracted, it would of necessity give off some energy as "heat" or other waste energy. This energy would exert a force, and it may not have an obvious carrier particle that we know of, as it may be a very low amplitude wave passing "inside" the space-time fabric, rather than the continuum contained by the fabric. Therefore we observe an expansion of space-time, but see no carrier particle. It would be a space-time wave. Absolute nothing apparently would have no properties, therefore it has no capacity to resist the encroachment of "something". So when you ask "expand. To Where?" it doesn't matter. It's possible in my mind that Dark Energy may even be the "Entropy" of space-time itself, or it may be the sum of "all entropy". Reading the paper, it is obviously bad stuff of a too common formula: taking still uncertain observations, add parameters to the fit without penalty, and observe that the new fit is better than the standard physics. Publishable as a possibility, but not useful. @dirk: This time it _is_ an added epicycle, likely unnecessary parameters, so bad science. Modern science is usually in the business to remove epicycles, that is after all why Kepler won through. I'd like to see some articles about the data not fitting the "standard simplest model" other than this one. That phrase made my antennae quiver. He says "some months now." That suggests he has some particular prior work in mind. They're suggesting that dark matter, whatever it is, is unstable and decays in a process akin to radioactive decay in normal matter. And that, further, when it decays, it produces dark energy. It's all terribly speculative, but that's all right. Until we know what dark matter and dark energy are, all we've got is speculation. The idea of an expanding universe is necessary in order to provide the necessary for the theory of biological evolution billions of years on planet Earth. These theories can not without each other and share the same strange principles. If the universe is static, as proved correct interpretation of the physical phenomena occurring in it, we can not be sure of the its age and may be quite young. For example, the trajectory and velocity of the stars in the galaxies we can observe are such that their shape and integrity can not be maintained for more than two spins. Astrophysicists know this problem and therefore invented the invisible dark matter through which has to ensure the stability of galaxies for a long time, but even this is not enough. At the same time, the galaxies have the same composition, shape and percentage of cemical elements in the entire visible universe, which clearly shows that either these parameters do not change with time or time was insufficient for the purpose. I don't think the universe is infinite,s o much is proven by observation. I believe the fundamental reality is infinite, which I believe is God. I do think the universe may be "finite but materially unbounded", meaning that it is potentially in a constant state of growth. I find a fallacy in the theory of "Imagining the Tenth Dimension" because he assumes a line may be arbitrarily drawn between alternate universes and our own, along some "nth dimension". I find that there need not be a dimension between two universes, as they need not exist in the same vector space. He assumes all universes exist in the same n-dimensional vector space, which there is no good reason to assume that. What is the boundary of the universe? I don't know. "Nothing" is not a vector space. The universe is a vector space (we think) and if it is expanding, as far as we can tell, the fact "Nothing" may be beyond it would seem to have no bearing on anything. You see, "Logos" must include the origin and foundation and totality all laws, all intelligence, all knowledge, including things not contained in a vector space, such as the notion of "is" or the notion of "equality" or the notion of "addition". We can't even fully conceive of this problem, because everything we know directly comes from experiences within the (presumed vector space) of our universe. So our minds real when trying to thing of EFFICIENT causes and laws outside or transcending the universe we know. 1plus4=5=True. (plus sign is broken on this board sometimes). How does "reality" know this is true? How does it work every time? We see no physical control mechanism for enforcing this addition (or multiplication, etc,) in gravity, for example, it simply appears to work. The equation we know is not reality. It is a description/model of reality, yet it works. How does reality know the definition of "equals"? or "plus"? Why are astrophysicists not afraid to mention "Model Dependent Reality" problems in their books, but they mostly won't touch the problem I mentioned above? I admit Hawking touched very briefly on it when he said something like, "What breathes fire into it all?" Yet he now denies the possibility of God as a "fairy story", even though he once admitted there had to be a Being (something to breathe fire into it all) in his own book. Instead, today we have Dawkins and Krauss claiming along with Hawking that "from nothing comes everything and for no particular reason, because we think it must have." The Bible claims God made everything from "Nothing," but the difference is the God is an Efficient cause. (Absolute) Nothing becoming something," contrary to their own axioms, and then try to use this to deny God. You could say they believe "Nothing disproves God." "The Bible claims God made everything from "Nothing"""
In fact God made everyting from light (energy). There is a big difference. So what did he make the light out of? and how? I have a calculation using the Kottler metric (the analytical solution to Einstein's field equations including spherically symmetrical matter [baryonic and dark] and a cosmological constant) that predicts this finding.....it also generates the initial and final values of the total matter/dark energy ratio. Energy and matter are eternal in the hierarchy space, but where they came from is pointless question. "Аnd God divided the light from the darkness"
This means that Creator has defined the laws of physics and properties of the vacuum of space in our universe. Ok, you don't believe the Bible is true so where are you getting your information from? So just how did the creator do this then? Is there a man on this earth who knows the answer to this question? In other words you don't have an answer. You don't believe the Bible is true, you have no idea how this creator of yours creates, so where are you getting your information from? Do you really believe, that the Bible reveals the creator's tricks? Even if you would believe in it firmly, it will not lead you to its understanding at least a bit. Oh you do not get what point Steve is trying to bring forward do you? I am not surprise one bit. Let me spell it out for you. T-h-e-r-e i-s n-o s-c-i--e-n-ce i-n t-h-e B-i-b-l-e and, let me add, or in any other religious books. So viko turns out to be another religious fanatic with a conspiracy theory about the entire scientific establishment. Thought so. You can tell when they start pretending we don't know anything about stars. I do not know how the Creator created our reality, but that's the least of our problems. I do not think any man will ever understand this. More important is to know the principles of life and to comply with them. And to know why we are here on this planet and what is our higher purpose. More important is to know the principles of life and to comply with them. And to know why we are here on this planet and what is our higher purpose. how can you base principles and purpose on fallacious arguments? how can you assume that your religion is valid when it is based upon a fallacy? you've not even realised that your book may not be the best, original or even real! who's religion is the best? xtians? jewish? muslim? buddhist? aw/daw is a model based upon a set of fallacies which are proven, with empirical data and experimentation, to be false. Faith in the Creator does not make you religious. I am calm and reasoned unlike you who became nervous lately, ended with yours arguments and started with qualifications. I argued with facts that can be verified, but you argue with compromised hypothesis. I'll remind you that the reason for the aggression is always fear, uncertainty or injured ego.The rating system is quite interesting and biased in this forum. This is some kind of moral support that you need. "ignoring the overwhelming evidence already supplied from various links which is the foundation of Evolution, proving that he is nothing but another troll creationist that cannot comprehend science nor how to argue it logically"
Misrepresentations are not evidence of anything. Do you know at all how to prove anything in science? I asked you to explain evolutionary processes in the cell but you are not able to do it because do not understand this problems. Yours is not science but ideology. You do not understand microbiology and genetics, so you collected few links and give them as flyers to your opponents in the forum to proof your point of view. if you argued with facts that can be verified, why are you not including links to those references in your posts? where is his compromised hypothesis? maybe you get downvotes because you offer no evidence? maybe because you've not substantiated your own claims? Do you know at all how to prove anything in science? Yours is not science but ideology. Who do you think would win in a court or debate? the one who could prove his argument or the one who was faithful to his belief? a well-substantiated explanation of some aspect of the natural world that is acquired through the scientific method and repeatedly tested and confirmed through observation and experimentation. We have little idea what dark energy and dark matter even are, aside from the effects we have observed, which does implies that they exist. There are no grounds, whatsoever, by which any mechanism could even be considered for "dark energy erases dark matter". If there is one thing we understand very well, it is how faith has always been a reliable and comfortable stand-in for knowledge before mankind began comprehending the universe we are in. Faith, by definition, is belief in spite of evidence. That's not a viable stand to take in reasoned discussion. "I do not know how the Creator created our reality, but that's the least of our problems. I do not think any man will ever understand this." pretty much kicks you out of the advanced study group. Here's something you can believe - if you're in a science class, you're probably flunking. -So why did he forget how rabbits are made? -And speaking of creation, why are there 2 conflicting creation myths in the bible? -And why does the book describe major things we know never happened, and people we know never existed? And why is jesus an obvious copy of a dozen godmen from earlier religions? Why did god write a book which fails to describe the world he created? -You cant debate the bible without acknowledging its gross errancy. Ahaaahaaaa I love how godders like to explain their stupor as some sort of inner peace. The space has a structure which is a transmission medium for information, electromagnetic waves and matter. Behavior of material particles depends on this medium. The key is in the properties of the cosmic vacuum. I'm closer to the idea of ​​eter than elastic space and other mathematical games. Cosmic vacuum may change its electromagnetic permeability depending on the presence of a concentrated mass or energy, or one another factor. This changes the behavior of electromagnetic waves and the force interactions between elementary particles. No need to be flexible. The water carries the waves but is not elastic medium. The idea of ​​expanding space in my opinion is not intuitive and creates more problems than it solves. Cliffs: We think the math says this, but we aren't sure. Where did you see this pink elephant? The proponents of the theory of evolution become nervous when someone starts asking awkward questions and exposed the weaknesses and contradictions in it. Then start personal attacks due to lack of arguments. In fact, this pseudoscience or rather religion has fallen into a stupor, because it can not explain the reality around us and constantly have to sew with white thread another strange hypothesis (patches). Its supporters have no scientific arguments but emotional reasons to believe in it. I have a lot of trouble believing that people who claim the drunken maundering of stone age sheep herders in a magic book called "The Babble" is better than On the Electrodynamics of Moving Bodies, A. Einstein, published as Zur Elektrodynamik bewegter Körper, in Annalen der Physik. 17:891, 1905, are serious. What drugs do you have to take to believe this? Can I have some? "The clusters appear to be moving along a line extending from our solar system toward Centaurus/Hydra" Kashlinsky said."